I was wondering if any owners of Rogge sets have ever tried to change the arm belt on the bellows. Why not just ask the maker? He is a friendly guy and certainly knows and could advise. What vintage is your Rogge bellow the old style or new style. My Rogge bellows from 1999 has the bellows leather cushion also glue and staples. I have replaced belts on my Rogge bellows with no problems a few times. 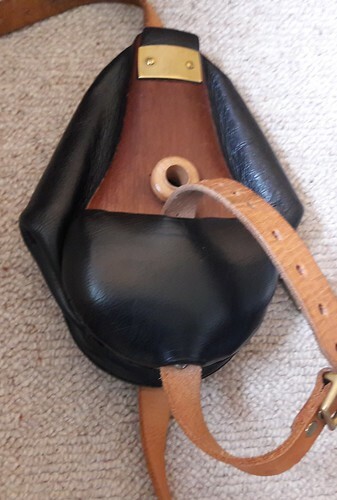 The arm belt in actually screwed onto bellows. The belt has two brass eyelets were the screw goes into. I managed to see the belt screwed under the leather cushion and was able to get screwdriver to unscrew the belt off. 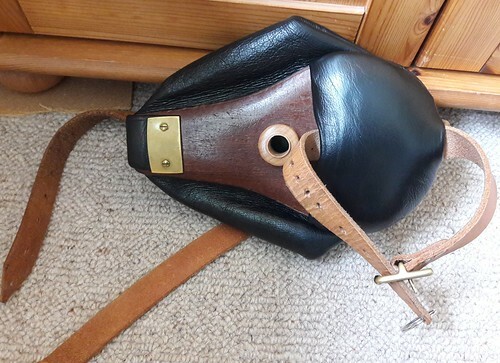 I used the old belt as template as I needed to punch new holes and attach new brass eyelet in the same place to match the holes under the leather cushion. My set is from 2017... I've tried to email Mr. R. on three occasions and never got an answer. Can you upload photo of your 2017 Rogge bellows. What Andreas Rogge email did you use as I use different one that not listed on this website. It´s difficult to get in touch with Mr. Rogge, his mail seems to have some problems, he told me a month ago.